Executive golf courses are nice when you have a limited amount of time, but you want to work on your short. Places like Pico Rivera Municipal Golf Course are perfect practice environments. 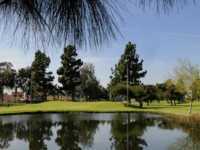 This nice little 9 hole course gives you excellent Pico Rivera golf deals. The course is located in Pico Rivera, Ca. about 20 miles from downtown Los Angeles. This par 29 course measures 1,500 yards with two par 4s. William F. Bell designed this course in 1965. The course has a rating of 35.5 and a slope of 80 on Bermuda grass. Several things make this course interesting. The greens are contoured but play fair. The course has sand traps guarding most of the greens. Also, the last 3 holes are played over water. The course definitely plays tougher than most executive courses. Since the course is lit for night play, Pico Rivera Municipal Golf Course tee times are available up until mid-evening 7 days a week. These Pico Rivera tee times may be reserved online or through the starter. The covered driving range and 2 putting greens are lit and available during hours of operation. Other amenities include a meeting room, pro shop, club rentals and a snack bar. Players agree this is a great Pitch N Putt. The course and practice facility are well maintained and convenient.